Despite overbought conditions, the Dow Jones Industrial Average broke solidly above dual trend line resistance at the 14,030 level and rose by 2.2% last week. Moreover, it appears to be in position to forge higher still. That is not to say that a healthy correction down to a retest of 14,030 is out of question. On the contrary, a pullback of that size would be justified knowing that profit taking before quarter’s end (and before the March 27th full sequestrate deadline is met) would be a reasonable digestive event to occur, if it does. Helping the move higher in equity prices was a series of improving employment reports last week including Friday’s monthly employment data. That being said, February’s participation rate fell to a 30-year low, In addition, the number of unemployed who have been looking for a job over the past 12 months but could find one ticked higher. Another lukewarm number was one showing that multiple jobholders moved higher as well. Still, last weeks release of the S&P/Case-Shiller Indices showed that the national composite of home pieces rose by 7.3% during 2012 reflecting the likelihood that a turn around in housing may be gaining traction. Moreover, a jump in factory orders, which rose by 7.2% in January, underscored the growing theme that business confidence is improving in the United States. 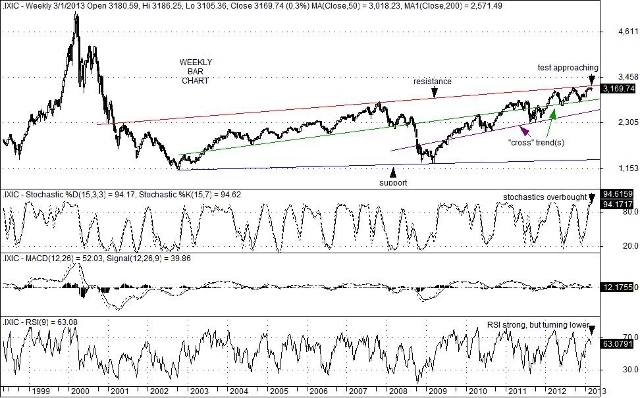 From a technical point-of-view and despite overbought conditions, weekly charts suggest that the intermediate-term “potential” for the DJIA is a possible move up to the 15,740 area (or a roughly 9.3% gain from Friday’s close). That “potential” is far greater than the corresponding “potential” for the S&P 500 Index (SPX) which targets a move up to the 1,600 area (or a roughly 3.2% gain). In recent weeks, negative outflows from equity mutual fund suggests that a near-term “correction” may be “in the cards” before reaching these “potential” targets, particularly after scoring outsized gains since the beginning of the year. The dilemma facing investors in futures months, however, is how to avoid getting “caught” in uncomfortable positions by purchasing equities at increasing higher prices if upsides gains are limited to the 3.2%-to-9.3% range. As it approaches key trend line resistance (dating back to 2001) at 3,225, the odds now favor a correction coming in the NASDAQ Composite Index (IXIC). 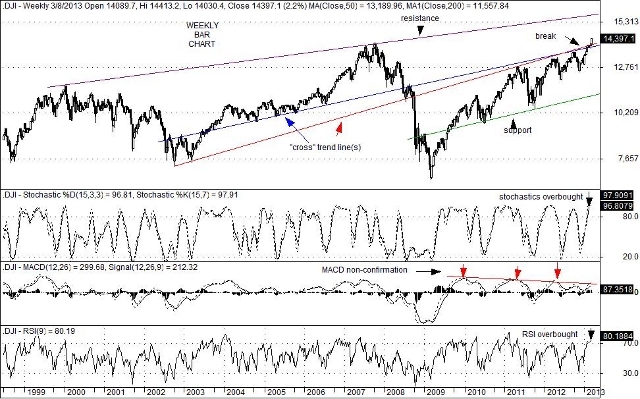 From a technical point-of-view, overbought conditions on both the weekly and monthly time frames suggest that while a bit more upside is likely for the IXIC, such a move would likely be an opportunity to trim positions and reduce exposure to the NASDAQ in coming weeks. Some global macro issues may begin to take their toll. They include the fact that Sequestration is now here; last week’s vote in Italy was clearly disappointing; anti-austerity demonstrations broke out last week in Greece and Portugal along with anti-government protests in Bulgaria; last week’s downgrade in U.K. sovereign debt resulted in a steep selloff in the pound sterling; and revised U.S. Q4 GDP rose by a scant 0.1%. Although each of these items was seen as a negative, none of them were considered to be truly unexpected surprises. Many investors had been expecting volatility since early December, which finally surfaced last week by way of a string of 100+ point daily moves (both up and down) on the Dow Jones Industrial Index. While the Dow Jones Industrial Index continues to close in on its all-time high, the NASDAQ composite index on the other hand remains well below its all-time high of 5,132.52 set in the year 2000 prior to the “dot.com” bust. The problem now with the IXIC (over the intermediate-term) is that a failure to lift above key trend line resistance at 3,225 could trigger a number of bearish technical divergences (including MACD) to emerge in coming weeks. Such a condition could, in turn, raise expectations for a technical correction down to either the 2,860 level or a much worse 2,600 test. You are currently browsing the Charted Territories blog archives for March, 2013.